When I explain to people how the government’s War on Drugs violates the rights of people to do dumb things to their own bodies, they intellectually understand but they’re usually not convinced. When I also explain why the Drug War causes additional crime and enriches mobsters, they almost always nod their heads in agreement but resist the obvious implication that we should decriminalize. When I then explain that the War on Drugs has led to horrific policies such as civil asset forfeiture and senseless policies such as costly and ineffective money-laundering laws, they agree that the consequences are bad but they’re generally unpersuaded about legalization. The stumbling block in every case is that they fear decriminalization will lead to more drug use, more addiction, and more suffering families. This report about Portugal from the U.K.-based Guardian is must reading and may convince the doubters that we can end the War on Drugs without societal chaos and decay. It starts with an observation about the ravages of illegal drugs. It was the 80s, and by the time one in 10 people had slipped into the depths of heroin use – bankers, university students, carpenters, socialites, miners – Portugal was in a state of panic. …one in every 100 Portuguese was battling a problematic heroin addiction at that time… Headlines in the local press raised the alarm about overdose deaths and rising crime. The rate of HIV infection in Portugal became the highest in the European Union. This led to predictable responses. In the early days of Portugal’s panic, …the state’s first instinct was to attack. Drugs were denounced as evil, drug users were demonised, and proximity to either was criminally and spiritually punishable. The Portuguese government launched a series of national anti-drug campaigns that were less “Just Say No” and more “Drugs Are Satan”. But something remarkable then happened. Rational voices began to push a libertarian-oriented message. And Portugal ultimately went in that direction – and got very positive results. In 2001, …Portugal became the first country to decriminalise the possession and consumption of all illicit substances. …The opioid crisis soon stabilised, and the ensuing years saw dramatic drops in problematic drug use, HIV and hepatitis infection rates, overdose deaths, drug-related crime and incarceration rates. HIV infection plummeted from an all-time high in 2000 of 104.2 new cases per million to 4.2 cases per million in 2015. …The official policy of decriminalisation made it far easier for a broad range of services (health, psychiatry, employment, housing etc) that had been struggling to pool their resources and expertise, to work together more effectively to serve their communities. Here’s a summary of the Portuguese approach, which certainly seems more humane and logical than what we do in America. Here’s a chart from the invaluable Mark Perry of the American Enterprise Institute. A 2009 study from the Cato Institute also highlighted the benefits of Portugal’s reform. Because more than seven years have now elapsed since enactment of Portugal’s decriminalization system, there are ample data enabling its effects to be assessed. Notably, decriminalization has become increasingly popular in Portugal since 2001. …very few domestic political factions are agitating for a repeal of the 2001 law. …none of the nightmare scenarios touted by preenactment decriminalization opponents — from rampant increases in drug usage among the young to the transformation of Lisbon into a haven for “drug tourists” — has occurred. …The political consensus in favor of decriminalization is unsurprising in light of the relevant empirical data. 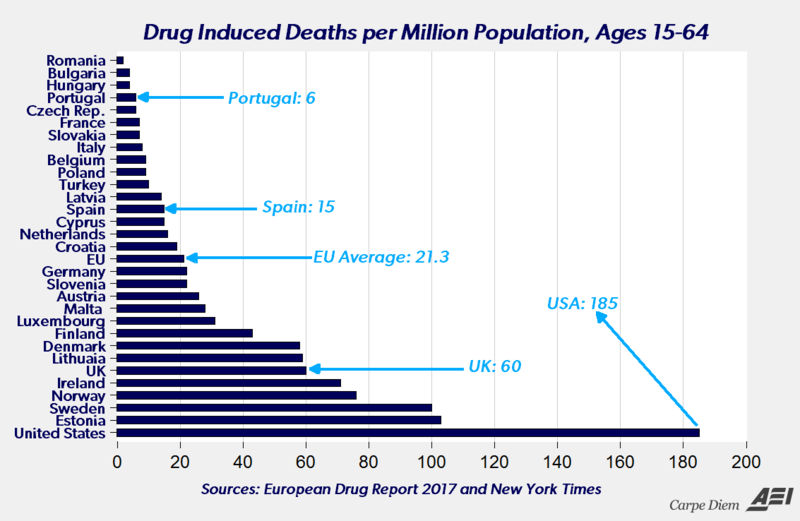 …drug usage rates in Portugal, which, in numerous categories, are now among the lowest in the EU, particularly when compared with states with stringent criminalization regimes. …drug-related pathologies — such as sexually transmitted diseases and deaths due to drug usage — have decreased dramatically. …judged by virtually every metric, the Portuguese decriminalization framework has been a resounding success. By the way, allow me to reiterate that my support for decriminalization is not an endorsement of drug use. It’s not just that I’m a teetotaler and want others to make the same choice. Stories like this one from CNN genuinely worry me. Regina Mitchell, a co-owner of Warren Fabricating & Machining in Hubbard, Ohio, told The New York Times this week that four out of 10 applicants otherwise qualified to be welders, machinists and crane operators will fail a routine drug test. …”We have a 150-ton crane in our machine shop. And we’re moving 300,000 pounds of steel around in that building on a regular basis. So I cannot take the chance to have anyone impaired running that crane, or working 40 feet in the air.” …For 48 of the 50 years her company has been around, drug abuse had never been an issue, she told Smerconish.”It hasn’t been until the last two years that we needed to have a policy, a corporate policy in place, that protects us from employees coming into work impaired,” she said. …there are almost 12,000 open skilled labor jobs in Mahoning County.”There are good-paying jobs and the opportunity for people in our area. We just can’t find people to show up who can pass a drug test,” she said. This is not good news for the country. And I’ve personally spoken to several employers in other parts of the country who have made the same point. But I’ll simply observe that we have this problem with drugs being illegal already. 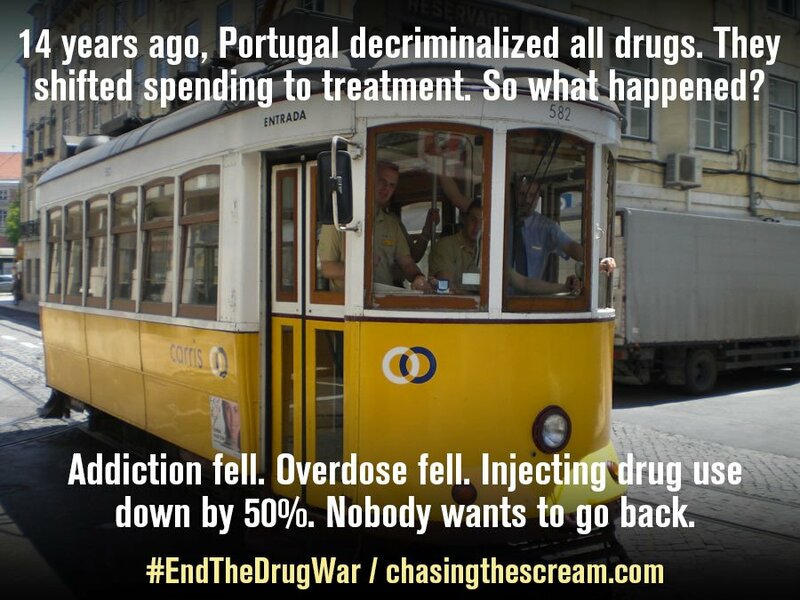 Given the evidence from Portugal, I’m hopeful that decriminalization might lead to less drug use. I also wonder whether redistribution programs enable reckless behavior. In other words, people may decide it’s okay to be stoners because they can rely on handouts to stay alive instead of staying clean and having a job. In any event, let’s review a couple of additional stories. Here’s a column from National Review, written by Michelle Malkin, which shows continuing progress on the right. My own interest in pediatric use of medicinal marijuana is more than academic. When my daughter, Veronica, fell ill in late spring of 2015 — unable to breathe normally, bedridden with chronic pain and fatigue — she saw of specialists. …The various drugs prescribed to my daughter weren’t working and had awful side effects. …To our surprise, the mainstream neurologist suggested Veronica try CBD. This doctor had other young patients who used CBD oil with positive results… So we did our own independent research…consulted with other medical professionals and friends — and entered a whole new world. Two physicians signed off on our daughter’s application for a medical-marijuana card. She became one of more than 360 children under 18 to join Colorado’s medical-marijuana registry in 2015. …we became pediatric pot parents. For Veronica, CBD provided more relief than all the other mainstream pharmaceutical interventions she had endured, and without the scary side effects. To her credit, Michelle has learned that the harm of government intervention exceeds any potential benefit. As a lifelong social conservative, my views on marijuana policy may surprise some of you. I used to be a table-pounding crusader for the government’s war on drugs. …But the war on drugs has been a ghastly quagmire — an expensive and selective form of government paternalism that has done far more harm than good. What has this trillion-dollar war wrought? Overcrowded jails teeming with nonviolent drug offenders. 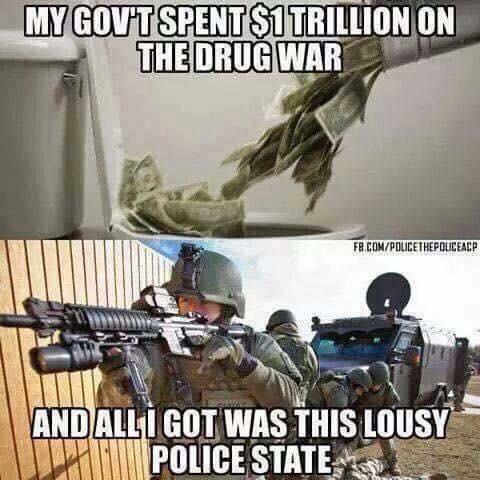 An expanded police state enriched by civil asset forfeiture. And marginalization of medical researchers pursuing legitimate research on marijuana’s possible therapeutic benefits for patients with a wide variety of illnesses. …let me be clear as a liberty-loving, conservative mom: Keep your hands off. Let the scientists lead. Limited government is the best medicine. Her commentary brings to mind this snarky – but accurate – image from Reddit‘s libertarian page. Now let’s add some economic analysis to the discussion. Here’s some insight from the Foundation for Economic Education about how the Drug War is increasing the potency and danger of drugs. One issue that is often mentioned but rarely explained is the increasing potency of illegal drugs, whether it be cannabis with a high percentage of THC in the US or super potent MDMA (Ecstasy) in Europe. What’s behind this phenomenon? …economic theory might have the answer. …The theory that can explain rising drug potency under prohibition was first described in 1964 by Armen Alchian and William R Allen. It states that when the price of two substitute goods is increased by a fixed per-unit amount (such as transportation or taxation) the consumer will opt for the higher priced, higher quality good because the price of the more expensive product has sunk in proportion to the price of the less expensive product. …In the particular case of illegal drugs, two different kinds of drugs–let’s say two different kinds of cannabis–act as the substitute goods. When buying illegal drugs on the black market, you do not only pay for the drug itself. On top of the monetary price comes the potential social cost you pay. This can range from a small regulatory offence, where you must pay a fine, to a felony where you can face a prison sentence. This comes with other problems: losing your job, family, social status and so on. This is the fixed per-unit cost added on top of the price of the drug itself. All of which leads to yet another reason why prohibition is backfiring and another reason why decriminalization is the answer. It is not worth the risk to buy a low-quality product regarding the potential price you must pay. …Drug cartels have recognised this behaviour and increased the potency of their drugs (i.e. improved the quality of their product) so you get more value for the potential fixed per-unit cost you pay. …What sounds good in economic theory becomes a massive public health problem in real life. The potency of many drugs has increased too much. As it is in most prohibitionist countries, many consumers don’t know exactly what drug they are taking and in which dosage they are consuming the drug: not to mention added substances that increase quantity. …If drugs were decriminalized, customers would have knowledge about the contents of their MDMA, their cocaine, their cannabis. Drugs that are too potent could easily be avoided. Legalized drugs would include packaging with the specific content. Sales in specialized stores would allow customers to receive medical help if they show signs of problematic consumption, without fear of being imprisoned over it. And since we’ve veered into some economic analysis, one of the reasons I favor legalization is that I don’t want law enforcement resources being misallocated. Which is why this column resonates with me. Police in Ohio are blaming a lack of resources for the fact that unsolved homicide cases greatly outnumber the cases that are solved, yet they seem to have the resources to arrest thousands of suspected cannabis users. …in the state of Ohio…an average of over 20,000 people are arrested on charges of cannabis possession each year. …despite the fact that they seem to have plenty of resources when it comes to arresting and detaining nonviolent offenders, police in Ohio are blaming a lack of resources for the fact that the number of homicide cases they solve continues to decline. …How did police in the United States go from solving over 90 percent of homicides in the 1960s to around 60 percent today, with cities like Columbus solving as little as 30 percent of homicides? 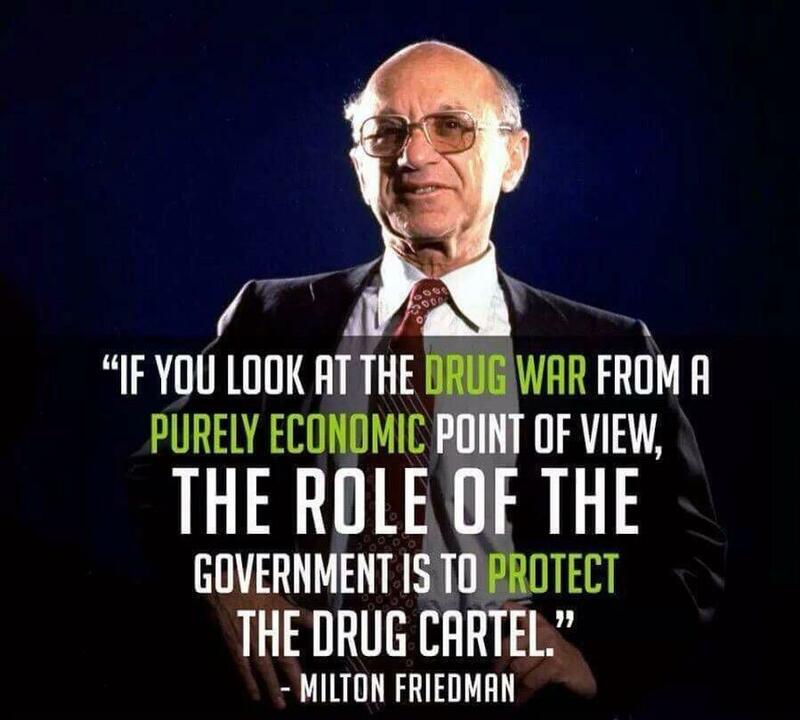 It was not a change in resources—it was the introduction of the Drug War. …“Around the country, police make more arrests for drug possession than for any other crime,” an ACLU and Human Rights Watch report found last year. “More than one of every nine arrests by state law enforcement is for drug possession, amounting to more than 1.25 million arrests each year.” In fact, police make more arrests for marijuana possession alone than for all violent crimes combined. …As states like Ohio find that the number of unsolved homicide cases greatly outnumber the cases that are solved, it makes you wonder—what more could they accomplish if they were able to use their resources to track down violent murder suspects, instead of wasting them on nonviolent individuals who are found in possession of a plant? Let’s close with some wisdom from Milton Friedman (h/t: Reddit). As was so often the case, Friedman was right. If you look at the real-world consequences of the War on Drugs, the net effect of prohibition has been to enrich some very bad people. P.S. It’s an open question whether the War on Drugs has been more damaging or less damaging than the War on Poverty. I guess the moral of the story is that there are a lot of “friendly fire” casualties when politicians declare war. d studying this, very good stuff, regards. Currently the marketing of illegal drugs focuses on getting the user “hooked”. They buy one thing and it’s laced with something else, so you have to become a regular user. Making it legal will clean up the product and take away the mystic of doing illegal stuff. and just what are the chances that the democrats and republicans will go along with that? One other point is the false narrative on pot being a “gateway drug”. It is only a gateway drug because it is being sold in the living rooms of dealers who have the option to then introduce children to stronger substances. This from the voice of experience. If you visit a guy’s house who is willing to go to jail for having sold you pot, he is also willing to sell you other items. The jail sentence is the same, so his risk is the same. And if he can get you to be a regular client, then he lowers his risk so long as you are not a narcotics officer or plant. So, drugs in general have become a social thing that passes through living rooms like Tupperware and Avon. Turn them into a clinical item, and their attraction is reduced. Well said, Dan. I’d only add one of my favorite quotes. “The Silk Road Saved Lives.” — Me.